Doug Babington came to California after coaching college volleyball for 10 years. His last college coaching position was at Texas Tech University. He worked there for three years as the recruiting coordinator and first assistant coach. Prior to a two-year stint as the first assistant coach and recruiting coordinator at Rice University, Babington spent two seasons as the head coach at Galveston College where he led the Whitecaps to a 59-29 record. Doug is currently the Head Volleyball Coach at Valhalla High School. They finished another successful season in 2017 and have made the CIF playoffs every year he has been at the helm. Babington has lead the team to a very successful record since arriving at Valhalla High School in 2006. After graduating from Tri-State University in Angola, Ind., with a B.S. in physical education (1995), he served as an assistant coach at Houston Baptist University (1996-98). He helped to build a team that was ranked in the top 25 and has remained a top NAIA volleyball program. Doug also has a M.A. in Health and Human Performance (2001) from the University of Houston – Clear Lake. Daniela Farrington’s first experience with volleyball was through her daughter, who played at Valhalla High School for 4 years and with Club Pacific during the off season. She loved watching the game and soon became involved with Club Pacific, first as a volunteer and later as a director when previous owner Mark Warner retired. She’s been handling the administration and finances for the club since 2007. In her spare time, she’s an accountant and Enrolled Agent for the IRS and works at a CPA firm. John Shirk coached at San Diego State University as a member of the Aztec volleyball coaching staff. 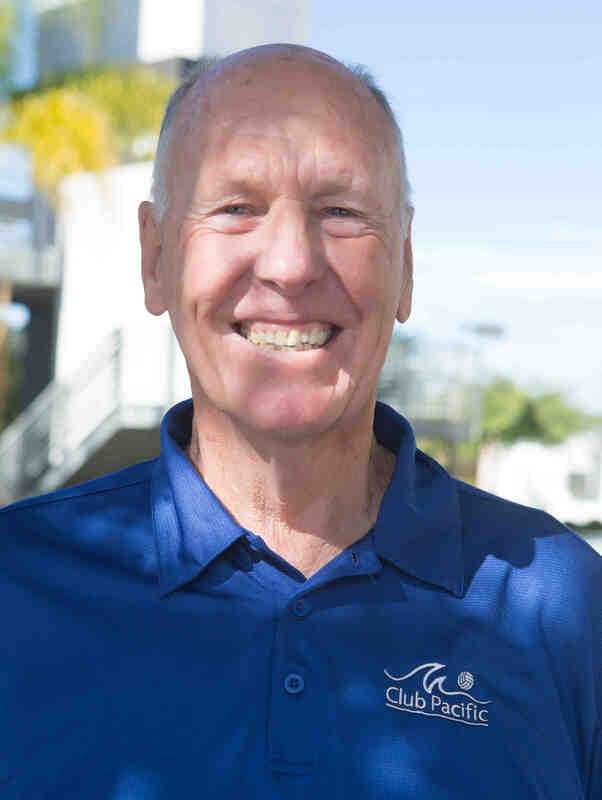 His coaching resumé spans all levels from club volleyball with Club Pacific girls’ volleyball and Seaside boys’ volleyball to a brief time with Fred Sturm as a volunteer with USA Volleyball in 1995. Shirk also is a co-director of Club Pacific. Prior to joining the Aztecs, Shirk spent the 1996 and 1997 seasons as associate head coach for the Lady Griffins of Grossmont (Community) College. He also served as the first assistant at Grossmont from 1992 to 1995, serving in a similar capacity with the school’s men’s team in 1992 and 1993. During that span, he helped the women’s team to three consecutive Pacific Coast Conference championships. Since 1994, Shirk has coached club teams which have competed in both the USA Junior Olympics and the prestigious Volleyball Festival. A native San Diegan, Shirk earned all-state honors as a middle blocker at Grossmont College during the 1991 and 1992 seasons. He has competed in open tournaments all over California in doubles, four-person, and six-player formats, both indoors and on the grass. Shirk graduated from San Diego State University in 1998 with a teaching degree in kinesiology. He completed a master’s degree in kinesiology in August 2005. He is currently the head coach at Mesa College for the Men’s Volleyball Team. Mark Warner is the former head coach of San Diego State University woman’s volleyball program. He retired in 2008 and his priority of excellence, both on the court and in the classroom elevated the SDSU woman’s volleyball program into one of the finest on the west coast. He also started Club Pacific in 1994 and is the former owner, president, and director. We are excited to have Coach Warner back into the Club Pacific family and look forward to having his expertise and knowledge to help guide our coaching staff. Besides coaching at Club Pacific Coach Warner is also the assistant Varsity coach at Valhalla High School. Coach Warner played college volleyball for San Diego State University winning the 1968 Collegiate National Championship. He then was a member of the 1975 USA National Team and following his collegiate playing career he continued to play with various club teams in the USA Volleyball. He is a 12 time USAV All-America, and has won the 1985, 1993, and 1994 senior division national championship. In 1993, Warner was named MVP at the USAV National Championships in the men’s master division. Mike has been a member of the Club Pacific volleyball family for many years. Mike just took on the position as Director of player development for all levels of Club Pacific. He is also currently the head volleyball Coach at Grossmont High School for the Girls Volleyball team and took them to the CIF Semi-finals this year in Division III. Mike has also served as the Varsity coach for the boy’s and girl’s at Granite Hills High School, 2001-2005 and Steele Canyon 2005 – 2013. In his spare time mike coaches beach volleyball. Mike began his playing career at Woodbridge High School in California and continued on to play at Orange Coast College in California and the University of Hawai’i – Manoa as a Middle Blocker. Mike’s strength in coaching is in transition and offensive systems and he is looking forward to helping his team get better individually and as a group. Chris Boaz is a 4th generation San Diegan who has been playing and coaching volleyball competitively for the past 19 years. Chris played volleyball at Valhalla High School where he was a member of the 2001 CIF Championship program and back to back to back Grossmont League Titles. During his Jr and Sr seasons he earned 1st team All-League honors as well as All-Academic team honors. Chris is in his 7thyear coaching at Club Pacific, he just took on the position as Director of Recruitment for the club and currently coaching a top 17s Travel team. Besides Club Pacific, Chris also coaches the Varsity girls program at West Hills High School who are coming off a deep run into Division 1 CIF and State Playoffs. Outside of coaching, Chris works at UCSD doing Fund Management for the Physics Department. Chris strives to mold his players to be not only prepared physically, but mentally as well.